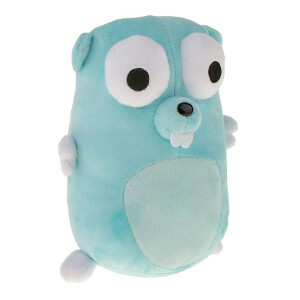 Gopherbot is a robotic gopher plushie that can be programmed using Go, and other programming languages too. Now you can code your own furrie robotic pet, security guard for your secret lair, or anything else you can imagine, and help out open source at the same time. Furrie hardware can be programmed using TinyGo and flashed using a USB cable. Once you have loaded your code, Gopherbot does not need to be connected to a computer. You have an LED on the end of a springie antenna. Boing! Blinkie LEDs are better when worn with fur, there is no doubt. 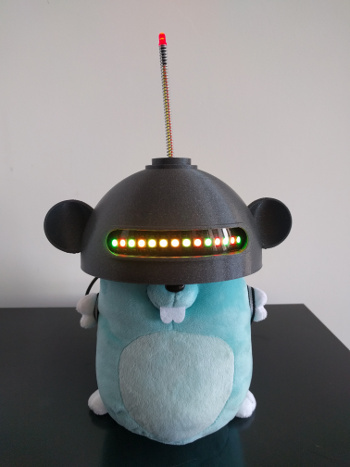 Each RGB LED in the Gopherbot visor can be individually controlled. Detect motion, measure the temperature, play sounds, or do them all at once, thanks to the Gopherbot built-in sensor backpack. Plus more Neopixel LEDs! Gopherbot is a cool way to help open source, have fun, and learn to program physical devices all at the same time. 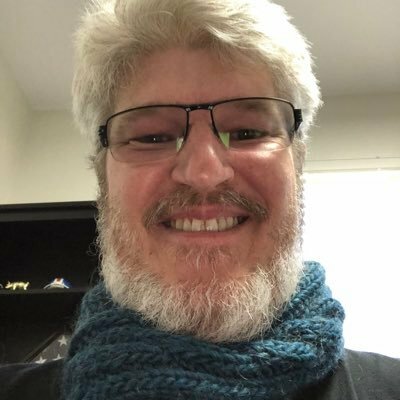 My name is Ron Evans aka @deadprogram and I am the creator of Gopherbot. The purpose of this campaign is to help fund the ongoing development of the open source software like TinyGo, GoCV, and Gobot that make Go hardware oriented programming possible. Sponsoring Gopherbot will help to do this and will also get you a fun thing to play with. Won’t you help out too? Thank you. 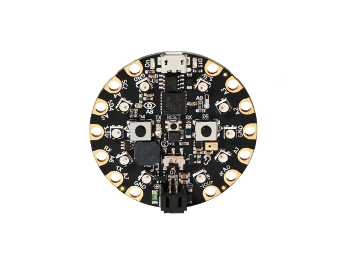 The brain of Gopherbot is a Adafruit Circuit Playground Express that has been connected to our special 3-D printed helmet with some gadgets installed. You can control the ‘Neopixel’ RGB LEDs in the visor, and separately control the LED in the springy antenna. TinyGo is a Go compiler that works for microcontrollers like the Circuit Playground Express. TinyGo gives you the power of Golang but small enough to run anywhere. 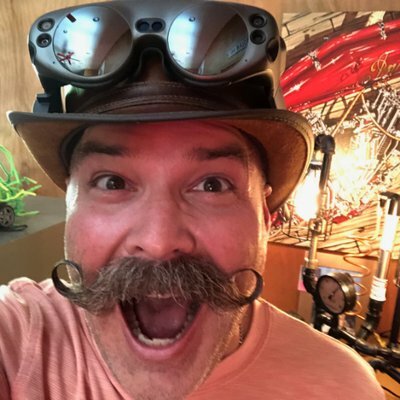 The full TinyGo code for Gopherbot is open source so you can modify and extend it to make Gopherbot do anything you want. This is such a beautiful thing…brilliant, adorable, and will be a win. If the machines are going to take over the world, they might as well be cute. I love this campaign! It’s geeky fun and well worth the price. I also liked the FAQs. No. Gopherbot does not have any moving parts. You can carry Gopherbot around with you. You can add your own mobility system, of course, using something like a Sphero RVR. Q. Is Gopherbot recording me? 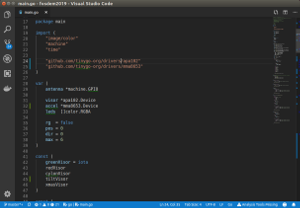 The microphone does not have audio recording support in Gopherbot. It is also not a very high quality microphone, probably better suited for detecting the presence of noise. You could prove us wrong by adding that capability to the software yourself. Q. Is Gopherbot uploading my personal data to the Gopherbot secret headquarters? No, Gopherbot does not have any wireless communication ability built-in. You could add a separate wireless adaptor yourself. Q. Can Gopherbot make sounds? Right now, Gopherbot can only make blips and bleeps, but we are working on the software to unlock the full set of audio capabilities thanks to the onboard Digital to Analog Converter (DAC). Q. Can I program Gopherbot in other programming languages? Yes, but why would you want to? JK, you can program Gopherbot using CircuitPython, Arduino, Rust, and probably other languages as well. None of these are directly supported by us except TinyGo, but it should work. Tell us what happens if you try that out! 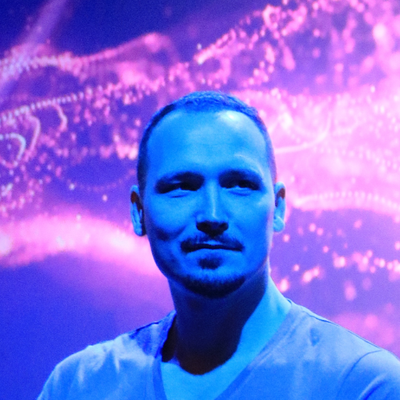 Copyright ©2019 The Hybrid Group | All rights reserved.